Taking an intensive Spanish course in Spain at an IH-certified school means that you are guaranteed high quality in both teaching and service. Only schools who maintain a high standard, verified by regular inspections, are allowed to be part of the worldwide International House network. 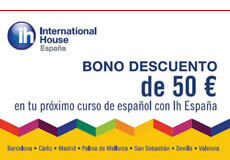 All our centers offer Intensive Spanish courses in Spain. Pick your course based on your own needs and goals; we offer special courses for exam preparation, business, groups, and more. There are intensive Spanish language courses for all levels and all ages, the most popular choice being the general intensive course. There are never more than 10 students in any given class as to assure that our teachers can give each student the personal attention they need. The most popular choice, opt for the standard (20 h/week) or super intensive (30 h/week). You can combine your intensive standard course with other special/extra courses. A perfect addition to your standard course. In your private lessons you can work on what you specifically are having the most difficulties with. Our senior courses are specifically designed to fit the more mature learner, both with regards to teaching methods and leisure activities. Do you need special knowledge and vocabulary for your work or studies? We offer business Spanish, medical Spanish, preparation for DELE exams and more. We offer various teacher training courses for those who want to become Spanish teachers. Certify yourself officially with the FELE course. Want to come with an entire school class or other group? We arrange tailor-made courses for groups bigger than 10 people.